Checkout is the lynchpin of e-commerce. It’s how customers buy and retailers get paid. Yet despite years of evolution, only a few changes have significantly impacted checkout conversion online. Knowing what worked, what didn’t, and what might can help improve checkout forms today and reveal what the future of digital shopping could be tomorrow. Digital shopping shows no sign of letting up. Americans spent $142.5 billion online in 2010 and e-commerce in the United States has seen double digit growth every quarter since. While an increase in the number of online buyers is a big reason why, recent innovations in personal computing are poised to drive digital spending even higher. The first wave of e-commerce was driven by the ability to purchase physical goods digitally. Growth of the desktop Internet and dropping costs of personal computers put the ability to buy online in many people’s hands and gave rise to online retail giants like Amazon and eBay. Since then, an increasing amount of goods are being created, distributed, and consumed digitally. Apple’s iTunes is the number one music store in the world with over 16 billion songs downloaded. Less than four years after the introduction of the digital Kindle book format, Amazon customers are now purchasing more Kindle books than hardcover and paperback books combined. New consumer devices are a critical part of digital media’s increased success. Amazon’s Kindle book format would be nowhere without the Kindle e-reader and Apple’s iTunes relies on over 300 million iPods and 365 million iOS devices for media playback. Networked mobile devices and digital content are not only creating more opportunities for e-commerce transactions, they’re changing what’s possible. These changes are leaving no part of e-commerce untouched. Especially not where the rubber hits the road in digital shopping... the checkout form. While e-commerce has continued to grow, the experience of buying online has remained largely unchanged for the past seventeen years. To this day, the most common digital shopping experience consists of finding an item you want to buy, adding it to a cart, then checking yourself out. Unsurprisingly this process just about always culminates in a form. After all, online retailers need to know who their customer is, where they want their item sent, and how they’ll pay for it. This has resulted in a fairly standard set of required input fields. While some e-commerce checkout forms vary from this list, most don’t. In fact, even the order of questions has become quite standard: personal information, shipping information, billing information, and a final verification step. This sequence actually builds on itself as shipping addresses determine final costs (shipping plus tax) and are often re-used for billing addresses. Details like this have been analyzed and optimized over the years to make sure that checkout throughput is everything it could be. Yet despite many years of optimization, online shopping cart abandonment rates reached 75% in the first six months of 2011. No wonder many companies are looking beyond standard form designs to improve their e-commerce conversions. Fundamentally, there are two ways to boost checkout conversion: increasing people’s desire to buy (persuasion) and reducing the effort required to make a purchase (efficiency) as the image below (originally crafted by Joshua Porter) illustrates. Marketing and sales teams have employed persuasive techniques to increase purchases long before digital shopping ever came along. But over the years, several of these techniques have also made their way into online checkout forms. Product design and development teams, on the other hand, have mostly focused on reducing the effort required to checkout through usability and technical innovations. These approaches have done a lot to optimize the throughput of standard checkout forms and recently gotten a turbo-boost from massive increases in always connected mobile devices and digital content. Due to all these efforts, checkout has evolved. Looking at the notable milestones in this evolution can not only help improve checkout forms today but also point the way to the future of e-commerce. So let’s dive into each. Because the information required at checkout is pretty much fixed, many retailers have turned to form organization and interaction design in an attempt to increase e-commerce conversions. In fact, it’s quite common to see large checkout redesign projects moving to single page forms, multi-page/step forms, or dynamic forms that manage multiple sections within a single interface. Apple’s most recent checkout redesign is an example of this approach. The company went from a multiple page checkout flow to a single page that reveals different sections only when they are needed. 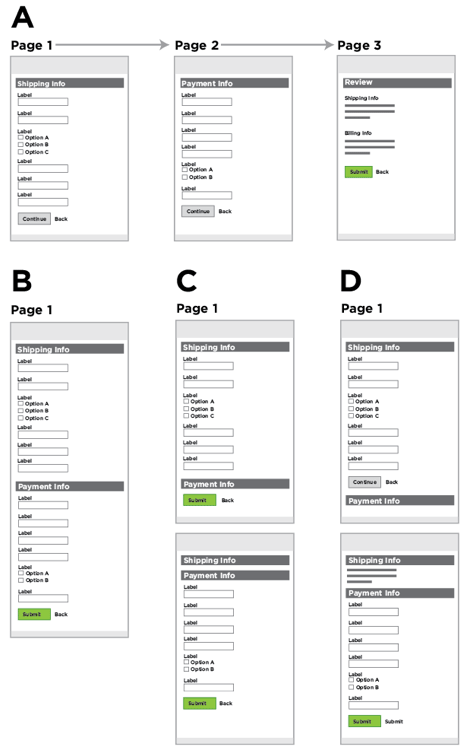 To evaluate the impact of this “accordion” design, usability testing firm, Etre and I ran some tests that compared a single page, multiple page, and accordion version of the same generic e-commerce checkout form (personal, shipping, and billing info). We measured standard usability and eye-tracking data for each. Each of the forms we tested had a 100% pass rate. While our study was small, it did seem to indicate that simply porting the same questions from one long web page to several web pages or to an accordion form isn’t likely to significantly increase conversion. Since then, I’ve seen seen this hold true in larger quantitative tests as well. This doesn’t mean that Web form design can’t improve the digital shopping experience. It just takes more than moving form fields across Web pages. Every question you ask someone within a checkout form forces them to decide what you are asking, come up with an answer, and then enter their answer into the affordance (form input) you have provided. Removing a question removes all of these considerations. And surprise… it can have a real impact. For questions that can’t be removed potential customers need to understand what’s required of them. A lack of clarity in form labels, input fields, or actions can cause people to misinterpret requirements, thereby leading to errors or failed submissions. Addressing these issues is a common way to boost form conversion. For example, a major online travel site had an optional question labeled “Company” in the payment step of their checkout form. Many customers mis-interpreted this question as a request for their bank information, which they entered in subsequent fields causing credit card verification to fail. The site removed the “Company” field and saw an overnight increase of $12 million a year in profit. Looking closely at each of the questions being asked during checkout can reveal many similar opportunities to clarify requirements and thereby boost overall conversion. Even when a form asks for the minimum amount of information necessary to complete checkout and does so clearly and concisely, mistakes can still happen. People don’t interact with checkout forms so they can fill them out accurately, they interact with them to buy something they want. In that moment of excitement, things can go wrong. Most checkout experiences will wait until someone submits a form before letting them know if something is actually wrong. But it doesn’t have to be this way. Real-time feedback can help people move through checkout by confirming appropriate answers, suggesting valid answers, and providing regular updates to help people stay within necessary limits while they fill in a form. In other large scale tests, I’ve seen real-time feedback reduce errors by over 80%. Because instant feedback turns data collection into a two-way conversation it enables people to get answers and fix mistakes as they complete forms instead of after the fact, which in turn helps improve conversion. In order to sell you something, a retailer needs to know how you’ll pay for it. In order to ship what you bought, a retailer needs to know where to send it. This information is required every time you buy something online. Wouldn’t it be better if you only had to enter it once? Saved accounts let you do just that. Simply authenticate into your account on an e-commerce site and all the information you entered before is there. No need to fill it in again. Since they were introduced, saved accounts have became so popular that it’s next to impossible to find an online retailer without them. In fact, saved accounts are usually the first step in checkout: have an account or need one? Yet most first time buyers don’t actually want an account –at least not yet. They’re there to purchase something not “enter into a relationship”. Repeat customers frequently don’t do better. 45% of all customers for a major Web retailer had multiple registrations and 75% of people who tried to login to an existing account by recovering their password never completed their purchase. It turns out reducing effort applies to saved accounts as well. Not requiring every customer to create an account removes a barrier to entry for many people. An increasing number of retailers have figured this out and now provide guest checkout prominently alongside saved account options. For one retailer, this change alone increased yearly revenue by $300 million. Not bad for a one button change. For people who are repeat customers, reducing the friction of checkout can increase conversion by making it faster and easier to buy. And there’s no faster way to buy something online than with 1-Click. 1-Click essentially removes all effort from the checkout process. Simply, click or tap once and the checkout process is complete. That’s it –really. 1-Click purchasing is important enough that Amazon patented it years ago and companies like Apple are paying Amazon to license the technology in their offerings. 1-Click is likely one of the big reasons Apple’s iTunes (the world’s largest media store) store can charge 3rd parties a 30% fee for selling digital content in their store. Instant and impulse purchases enabled by 1-Click drive purchasing volume up so retailers sell more. Because 1-Click is patented by Amazon, other retailers aren’t free to use the same approach on their sites. They can, however, remove as much effort from checkout as possible through guest checkout, saved accounts, free shipping, and more. High shipping costs are the number one reason why consumers were not satisfied with their online shopping experience. 93% of people surveyed indicate that free shipping would encourage them to purchase more online. So it’s little wonder that free shipping offers have had a big impact on conversion for retailers. In 2004, 60% of all online retailers considered free shipping to be their most successful marketing tool. In 2011, a record 92.5% of online retailers were expected to offer free shipping promotions. In the evolution of e-commerce checkout, free shipping is a significant milestone. Not only does it remove the need to calculate postage costs by entering a destination (usually Postal/ZIP code), but it also aligns perfectly with the core values of e-commerce: convenience and price. No need to worry about how much it will cost to ship –it’s free! In cases where free shipping is not possible, fixed shipping costs can help clarify what people will need to pay up front. Complicated shipping policies and calculations that have to be done by the customer, on the other hand, are likely to make conversion rates suffer. Shipping costs impact the decision to buy online so much that some retailers have developed loyalty programs based primarily around the promise of free shipping. The largest of these is Amazon’s Prime program which is estimated to include about five million members. Increase their purchases on Amazon from $400 a year to $900 a year after they join. Spend 130% more than regular Amazon customers. May be responsible for as much as 20% of Amazon's overall sales in the U.S.
Buy on Amazon even if the item is less expensive somewhere else. With estimated increases like this, Amazon Prime maybe the most successful solution to the problem of e-commerce shipping costs yet. It may even be the most successful conversion increasing product Amazon has launched to date -1-Click included. So it’s not surprising that other retailers have noticed and followed suit. Williams Sonoma’s Reserve program ships all its online products for free when a customer signs up for $30 a year. Sears’ ShipVantage program ships all products for free after a $79 a year fee is paid (the same price as Amazon Prime charges). When we want something bad enough, even complex forms and shipping costs won’t keep us away. That’s the idea behind increasing desire in e-commerce: encouraging people to complete checkout by making it exceptionally clear why they should. Lots can be done before a customer ever makes it to a checkout form -but once there, similar principles apply. Perhaps the earliest examples of increasing motivation in checkout form design were visual verification “seals” from companies like Truste and VeriSign. In the initial phase of e-commerce, people were unsure about the security of their transactions. So verification systems sprung up to make people more comfortable with buying. To understand why this approach worked, we can look at underlying (often subconscious) psychological motivators. In particular, people will follow instructions when they come from perceived authority figures like VeriSign and Truste. Trust can also be increased with prominent phone numbers, pictures of previous customers, their testimonials, ratings, and professional design. Trust isn’t the only psychological motivator that can increase people’s desire to checkout. The Living Social checkout experience highlights the amount of people that have already purchased an item and the time left to buy it. Seeing the number of purchases already made increases motivation because people tend to follow the lead of others (social proof). Time left infers value in something that has limited availability (scarcity). For a full list of psychological motivators that could be used to increase conversion, look into Stephen Anderson’s Mental Notes cards. Mobile devices are turning the physical world into a digital shopping cart. 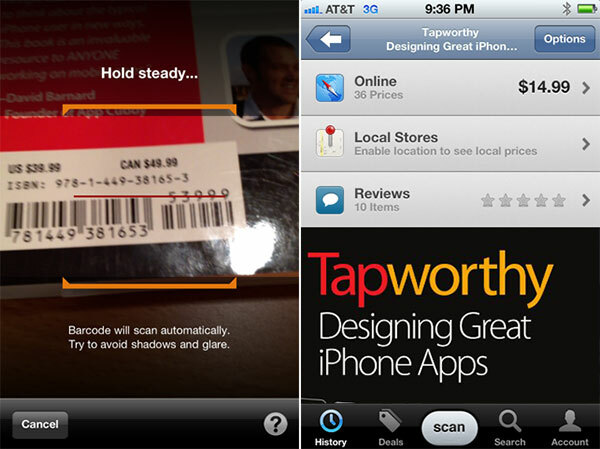 Just point a mobile device’s camera at a product barcode to scan, identify, and buy it. Barcode scanning app, RedLaser has seen scans go up 50% over the past year as an increasing number of customers compare prices and make purchases using their mobile device’s camera in stores and homes. But you don’t have to rely on barcodes to purchase what’s around you. Image recognition apps like Google Search can identify books, movies, music, wine labels, and more. Just take a picture of the product you want to buy and checkout right on your mobile device or use its location detection capability to find the closest physical store selling what you want -no shipping costs necessary. Amazon’s Flow is perhaps the most impressive example of reducing the gap between products in the physical world and digital shopping. Through a continuous image recognition system, Flow allows you to point a mobile device at barcodes or products. Once identified, it only takes a single tap to order the product from Amazon using 1-Click checkout. When coupled with Amazon Prime, the product is shipped free and arrives within two days. If that’s not the bleeding edge of digital shopping I don’t know what is. Online retailers aren’t the only ones that benefit from turning the physical world into a digital shopping cart. Mobile devices can expand the presence of physical retailers too. Consider the Korean grocery company, Tesco. Tesco created a series of virtual storefronts in high-traffic locations like subways by putting up large poster-sized images of the aisles you’d normally see in a grocery store. Each product shown in the posters has an associated QR code that can be scanned using a mobile device’s camera. Once a customer has scanned all the products they’d like to buy, they can check out on their mobile device and their order is delivered to their home usually the same evening. This early example of digital interactions with physical representations of products have turned out to be quite successful for Tesco. So it’s likely we can expect to see similar ideas around the globe soon. The physical world is more than just a catalog for digital shopping applications. 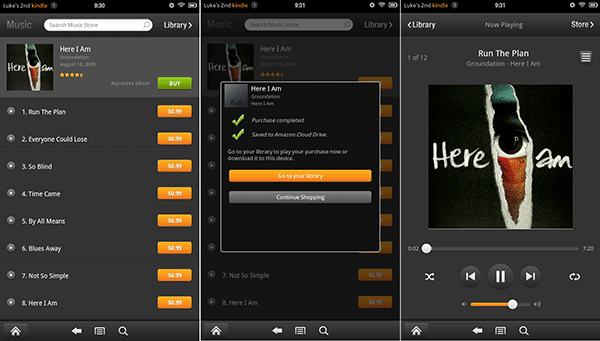 It can also work in concert with mobile devices to bring the best of physical and digital shopping together. Two early examples from Apple do a great job of illustrating the potential of this hybrid approach. Available in the Apple Store app, Personal Pickup is a feature that allows customers to buy products on their mobile device and pick them up in an Apple retail store later. Thanks to location detection technology, Apple retail employees are notified when a customer arrives to pick up their purchase. 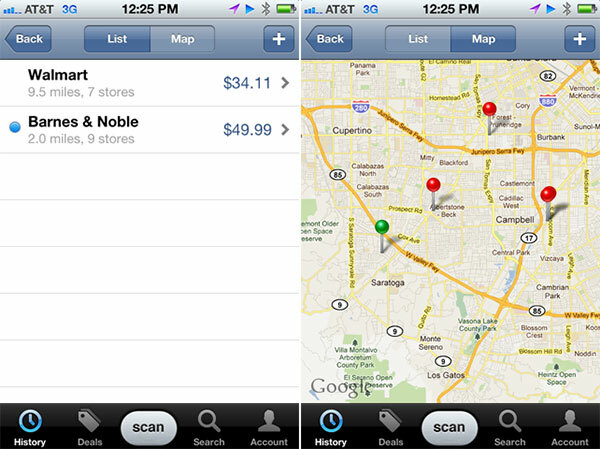 The Apple employee can see the location of the customer in the store and promptly hand them their purchase. Checkout complete. 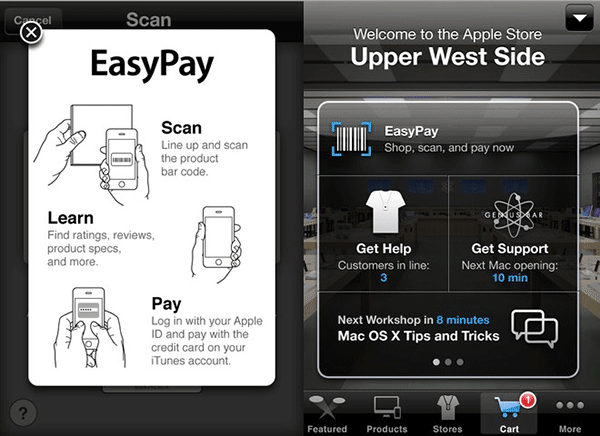 EasyPay, also in the Apple Store app, allows customers to scan the barcodes of “select accessories” within an Apple retail store and pay for them within the app using 1-Click or their saved accounts. The app uses a customer’s current location to apply the proper amount of sales tax to their total bill. Self-checkout complete. Mobile shopping apps that take advantage of capabilities like camera access and location detection can minimize the gap between the physical world and digital shopping. But they’re still standalone applications. Shopping devices, on the other hand, turn an entire tablet, media reader, or mobile device into an end-to-end complete digital shopping experience. Product discovery, purchase, and consumption on these devices is never more than a tap apart. Find a digital book, song, movie or TV show in an integrated storefront or promotion, tap to buy, then enjoy it seconds later. This integration removes practically all the friction in e-commerce: no shipping required, 1-Click purchasing, and instant delivery. 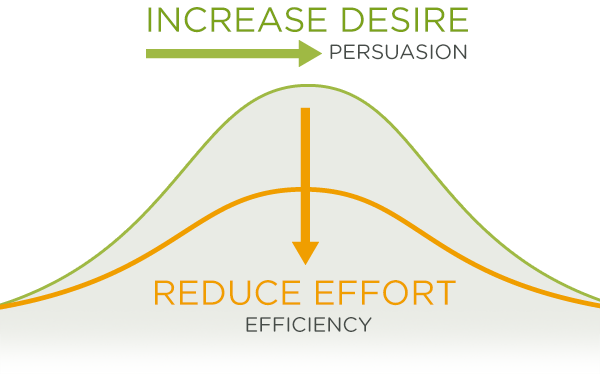 Without friction, conversion goes up. When it’s so easy to buy and immediately enjoy content, people do it more often. As proof, Amazon customers are now purchasing more digital Kindle books than print books –due in no small part to Kindle device integration. Though Amazon hasn’t revealed how many books the average Kindle user buys (estimates range between 11 and 27), their aggressive pricing of Kindle devices suggests that their profits actually lie in subsequent purchases of books not in the device itself. If shopping devices continue to drive increases in purchases and conversion, it’s likely companies will be even more aggressive with pricing. At $79 dollars, Amazon’s Kindle is already looking like a disposable digital shopping cart for books. Close behind at $199, the Kindle Fire tablet was poised to do the same for music, movies, games, and more. But recent estimates show it may not be living up to expectations. Over the past seventeen years a few notable checkout improvements like 1-Click and free shipping have boosted e-commerce conversion. But overall, progress has been slow -until now. Digital content and mobile devices are growing at a breakneck pace creating many new opportunities for e-commerce. From friction-less checkout on dedicated devices to services that combine the best of physical and digital shopping, we’re just seeing the start of what’s possible. There’s never been a better time to “checkout” what’s next.